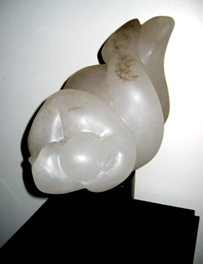 This piece is that pregnant wait for the thunderhead to be awakened. Look closely and you will see the dark clouds in the stone being driven by the wind. 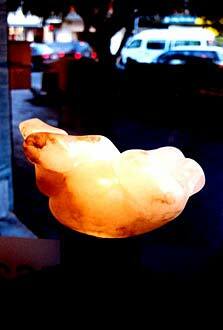 The sculpture sits on a plinth that illumines this fabulously translucent stone. Price: (AUD)$4,400 + GST (ex-studio). Note: Plinth is extra and would be made to suit your space eg. timber veneer, painted, or stainless steel.